Distribution and habitat: Tibouchina urvilleana are evergreen plants from the tropical rainforest in southern Brazil. 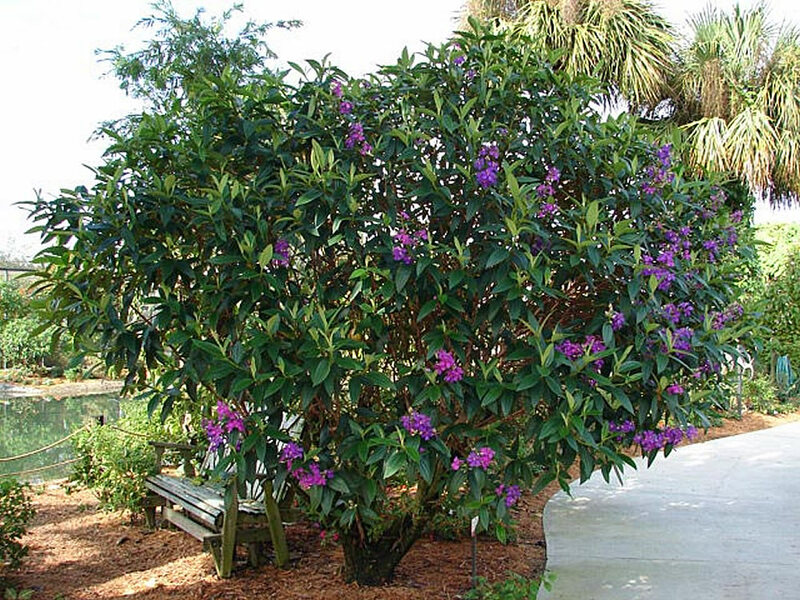 They are widely cultivated in warm regions for its soft foliage and showy purple flowers. The Tibouchina urvilleana grows as a large, woody shrub or tree up to 3m (10 feet) height and it is a truly spectacular plant when in full bloom, bearing magnificent, saucer-shaped purple flowers with an iridescent sheen which are set off to perfection by the velvety foliage. Tibouchina urvilleana can become invasive species in tropical and subtropical environments outside of their cultivation range. All Tibouchina species are considered noxious weeds in Hawaii. 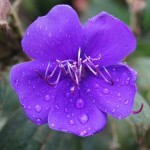 Description: Tibouchina urvilleana is a shrub that grows up to a metre (3 feet) as so tall indoors. Its four-angled stems and branches are soft, green and covered with fine, reddish hairs when young. Later the stems turn woody and brown. The velvety, pointed-oval, paired leaves are medium to deep green with prominent, pale green, lengthwise veins and finely toothed edges. Each leaf is 5-10cm (2-4 inch) long and 2-3cm (0.8-1 inch) wide. The striking saucer-shaped, five-petaled flowers are rosy purple to violet colour with a cluster of protruding purple stamens in the centre. Each flower is about 8cm (3 inch) across. The flowers are produced in clusters at branch tips from mid-summer to early winter. Proper care: Tibouchina urvilleana is grown as indoor plants but require some special conditions and are unlikely to thrives without them. It has a fairly narrow margin for error: leaf drop and plant decline are unfortunately common, most often because of watering or temperature issues. 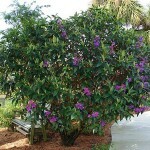 It is a fast growing shrub. Shorten main shoots by half their length and cut side-shoots back to two pairs of leaves each spring. 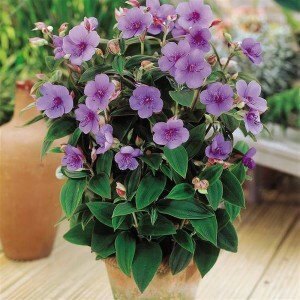 In this way the leggy growing habit of Tibouchina urvilleana is kept under control and will enhance the flower display. Light: Give Tibouchina urvilleana bright filtered light from early spring to mid-autumn. During the short-day months keep plants where they can get about four hours a day of direct sunlight. Temperature: During the active growth period normal room temperature are suitable. During the midwinter rest temperature of about 10°C (50°F) are best. It is a good idea to stand actively growing Tibouchina urvilleana on trays or saucers of damp pebbles to increase the humidity around the plant. Watering: During the active growth period water plentifully as often as necessary to keep the potting mixture thoroughly moist, but never allow pots to stand in water. During the rest period give only enough to make the mixture barely moist throughout. Feeding: Apply to Tibouchina urvilleana plants standard liquid fertiliser about every two weeks during the active growth period. Potting and repotting: Use a soil based potting mixture. Move plants into larger pots every spring until maximum convenient size is reached. Thereafter, top-dress annually with fresh mixture. Gardening: Tibouchina urvilleana thrive in moist, humid, tropical, subtropical and warmly temperate regions. Out of its hardiness zone, the plant grows as a large, woody shrub which is best kept in a conservatory, sunroom or heated greenhouse. It will tolerate light to moderate frost if they are planted in a very warm, protected part of the garden, the plat is covered in winter and the roots thickly mulched. If the plant is cut right back by frost it will usually grow back from the roots in spring. Their growth habit tends to become somewhat leggy if the plants are not frequently trimmed to keep them bushy; and because they bloom on new growth, trimming immediately after flowering will encourage more new growth and consequently more flowers. They do however have a remarkable ability to re-grow from ground level after being snapped off, and consequently respond well to hard pruning. Position: Tibouchina urvilleana love full sun, but too much harsh sunlight can also be a problem; in a very hot or dry region plant these shrubs in a sunny location which is semi-shaded during the hottest part of the day. These plants are brittle and prone to breaking in the wind, so plant them in a sheltered position in the garden. Soil: Tibouchina urvilleana prefer slightly acidic soils with a good amount of organic matter and good drainage, but will adapt to most well-drained garden soils: from very acid to slightly alkaline. Tibouchinas will not thrive in soils that are too alkaline and will show signs of burn around the leaf margins and yellowing between the leaf veins. They are adapted to chalk, clay loam, loam, loamy sand, sandy clay loam and sandy loam soils; but if the soil is less than ideal, dig lots of acid compost into the planting hole and mulch the roots often. These plants can sometimes be difficult to establish, and after planting, they may seem to lack the growth for a season or two, but once they are fully settled they will suddenly became fast growers. Irrigation: Water regularly during dry spells to prevent the plant from drying out, but do not keep the soil saturated or root rot can result. Fertilisation: Feed regularly with a balanced organic fertiliser to encourage new bud formation. Propagation: Take stem or tip cuttings 8-10cm (3-4 inch) long in spring. Trim each cutting to just below a pair of leaves, remove the bottom leaves and dip the cut end of cutting in hormone rooting powder. Plant the cutting in an 8cm (3 inch) pot filled with a moistened equal parts of peat moss and coarse sand or perlite. Enclose the whole in a plastic bag or propagating case and stand it in a warm room in bright filtered light. When new growth appears, uncover it and begin to water it moderately. After a further eight weeks, move the young plant into a 10cm (4 inch) pot of standard potting mixture and treat it as a mature specimen. Tibouchina urvilleana can also be propagated by seed. Sow seeds in spring using a mixture of three parts soil-based compost and one part gritty sand. Do not cover the seeds. Place the pot or tray in indirect light at about 21°C (70°F) until the seeds start to germinate. Pot on when the seedlings are large enough to handle. 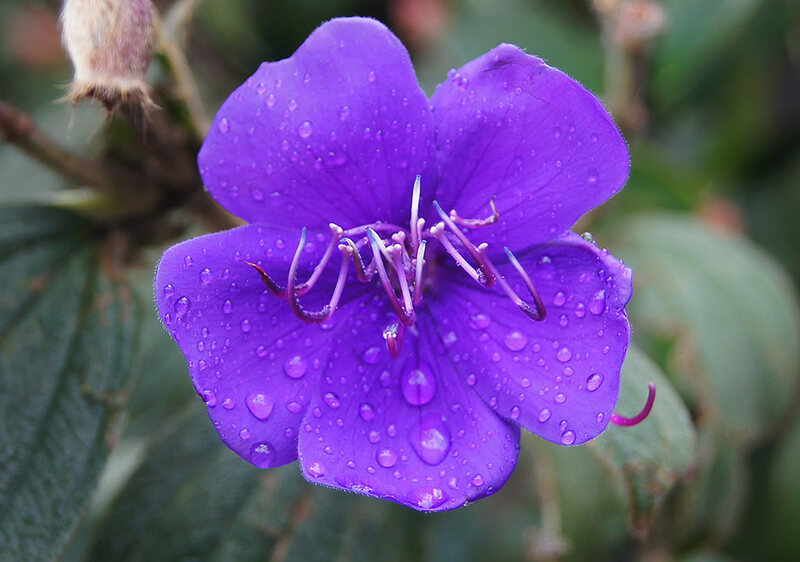 Problem: Tibouchina urvilleana are susceptible to gray mold, mushroom root rot, leaf spots, root rot of seedlings, spider mites and nematodes. If exposed to cold drafts or strong sunlight, expect the plant to start dropping leaves. Mushroom root-rot can occur if drainage is bad or the plants are over watered. Treatment: There are no effective chemicals to control the disease. If there is not sufficient air circulation, leaf spots and spider mites can be problematic. Leaves turn yellow and drop in winter if the plant is overwatered. Treatment: Allow to dry out and water less in future. Leaves turn brown and dry during the summer when the growth environment are too dry. Treatment: Increase water and humidity levels and move out of the sun. Yellow stippling on the leaves is due to red spider mites (which look like tiny red dots) on the undersides. Mealy bugs look like small blobs of fluffy white cotton. Treatment: Remove them with a cotton swab dipped in diluted methylated spirit. Use a suitable insecticide for severe attacks. Companion plants: Border companions for Tibouchina urvilleana blooming shrub include the Pink Bower Vine (Pandorea jasminoides ‘Rosea’) to scramble over a nearby arbor, Dwarf New Zealand Tea Tree (Leptospermum scoparium ‘Nanum Ruru’) with its tight growth and pink flowers and Oleander (Nerium oleander). Uses and display: Tibouchina urvilleana growth habit is somewhat weedy, requiring training and pruning to develop and maintain it as a tree. It can be trained as a standard or espaliered against a west-facing wall receiving at least five hours of full sun. It can also be trained on a trellis or arbor as a vine. Pinching new growth helps increase branching and will enhance the flower display. It is a nice addition to contemporary, cottage or tropical gardens. This plant will attract butterflies into the garden. Plant it near outdoor living areas where its flowers can be closely enjoyed. The handsome foliage adds texture and interest to shrub borders and foundation plantings and delivers splashes of color that grab the attention of all who come near. 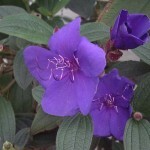 The spectacular Tibouchina urvilleana flowers are used as cutting for bouquets. 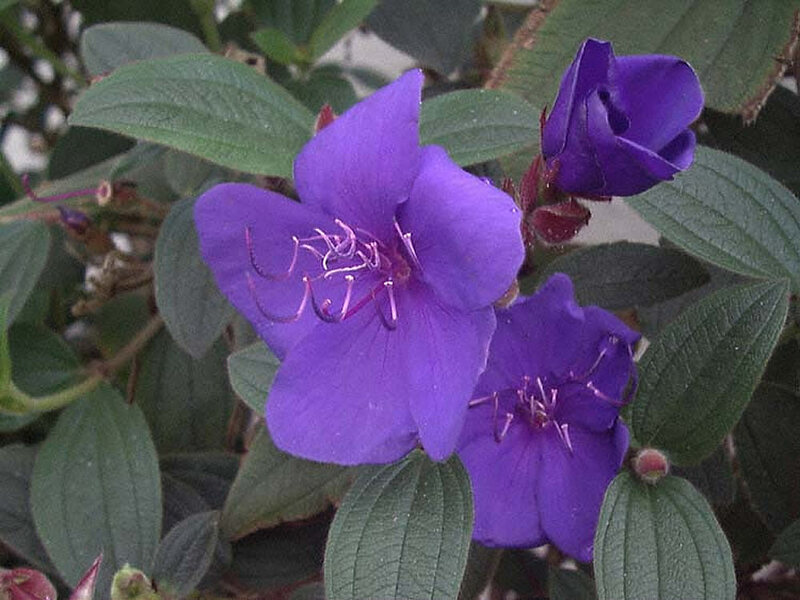 Also, Tibouchina urvilleana are suitable for container accent, being favored by modern designers for its pubescent foliage and intense color. Large specimens can be trained on a trellis or against the wall of a conservatory.